DOV 216,303 is an antidepressant drug originally developed by DOV Pharmaceutical and now licensed to the larger pharmaceutical company Merck & Co., which is currently in clinical trials. 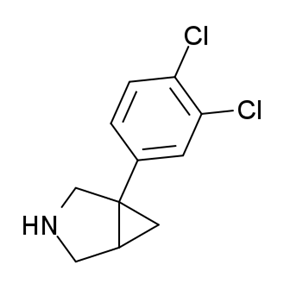 It is a so-called triple reuptake inhibitor (TRI), or serotonin-norepinephrine-dopamine reuptake inhibitor (SNDRI). It is the racemic mixture of amitifadine (DOV 21,947) and its (–)-enantiomer. Its IC50 values for SERT, NET, and DAT are Ki 14 nM, 20 nM, and 78 nM, respectively. It is closely related to DOV 102,677 and amitifadine, both of which are also being developed in collaboration with Merck. ^ a b Mitchell, S. (2006-03-04). "SSRIs face next-generation replacement". United Press International. ^ a b Skolnick, P.; Krieter, P.; Tizzano, J.; Basile, A.; Popik, P.; Czobor, P.; Lippa, A. (2006). "Preclinical and Clinical Pharmacology of DOV 216,303, a "Triple" Reuptake Inhibitor". CNS Drug Reviews 12 (2): 123–134. ^ Epstein, J. W.; Brabander, H. J.; Fanshawe, W. J.; Hofmann, C. M.; McKenzie, T. C.; Safir, S. R.; Osterberg, A. C.; Cosulich, D. B.; Lovell, F. M. (1981). 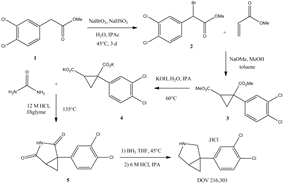 "1-Aryl-3-azabicyclo[3.1.0]hexanes, a New Series of Nonnarcotic Analgesic Agents". ^ Epstein, J.; Brabander, H.; Fanshawe, W.; Hofmann, C.; McKenzie, T.; Safir, S.; Osterberg, A.; Cosulich, D.; Lovell, F. (1982). "Additions and Corrections- 1-Aryl-3-azabicyclo-[3.1.0]hexanes, a New Series of Nonnarcotic Analgesic Agents".